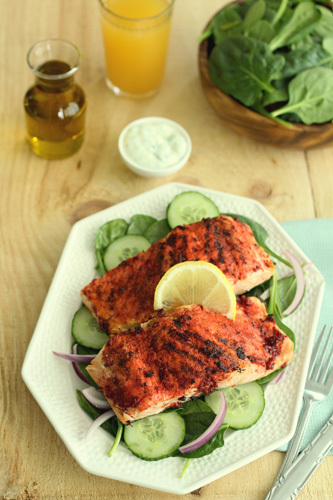 Tandoori dishes are usually served with naan or grilled vegetables on the side, but to keep things fresh, I’ve paired the salmon with some fresh spinach, cucumber and pickled onions. This is a great way to start experimenting with Indian flavours, if you haven’t done so already. Hope you enjoy this spring salad! Remove the skin from the salmon fillets. Sprinkle salt and press it down on both sides of the fillets. Mix the ginger, garlic, oil, tandoori masala and chilli powder. Apply to both sides of the salmon fillets and marinate for 15 to 30 minutes. While the salmon is marinating, preheat the oven to 400F. Prepare the pickled onions by mixing the onion slices with the rice wine vinegar. Let this sit for at least 15 minutes and then drain. To prepare the yogurt sauce, mix the cilantro and yogurt with a little salt and pepper. After the salmon has marinated, heat a grill pan or frying pan on medium heat with a little oil. Sear the salmon on each side for 2-3 minutes per side and then transfer the salmon to a baking sheet and bake for 4-5 minutes in the oven. While the salmon is baking, prepare the salad. Start by mixing the olive oil, lemon juice, salt and pepper in a small bowl. In another bowl, toss the spinach, cucumber and pickled onions together. Add the salad dressing and toss well. Serve the salmon on a bed of salad. 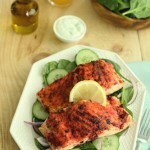 Add a little lemon juice on the salmon prior to serving and add a dollop of the yogurt cilantro sauce. Enjoy!